We ended the 2012 season knowing that we had lost the space we had called home for the last few years. Finding a new workspace proved to be a difficult task. Instead of a typical fall season working on programming, building a test robot and more; we spent it in a classroom doing what we could. In November, we finally had a new “Doghouse”. We were thrilled to find that our new space was heated! This year, we had one of the largest teams to date, many with little or no experience, but lots of enthusiasm! For the last 3 seasons, we had created scouting apps for iPods/iPads. This year, we had it approved by Apple, making it available through the iTunes store for all teams to use. In March we traveled to Duluth, Minnesota for the Inaugural Northern Lights Regional. This was our third inaugural event! We had a lot of great matches against a lot of great teams! After qualifications we were ranked 12th. We were selected as the first pick by team 2169 and were joined by 3061, a team mentored by a former Swartdog. We were undefeated throughout eliminations. We were honored to receive both the Industrial Safety Award and Quality Award. Later that month we competed at the Minneapolis 10,000 Lakes Regional. We were ranked #2 and partnered with 2052 and 3244 to win the regional. Swartdog junior; Jared Failer received the FIRST Dean’s List Finalist Award. It was at this event that the Swartdogs celebrated the highest achievement in our history. We were extremely proud and honored to receive the Regional Chairman’s Award. 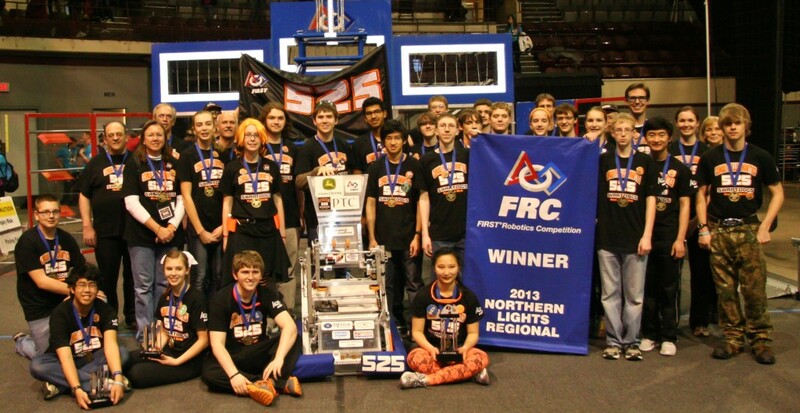 We ended the season with three blue banners, a unique distinction shared with only 13 other FRC teams in the world. 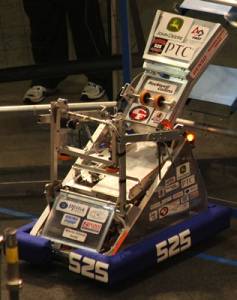 The Ultimate Ascent SM was the 2013 FRC game. The game was played by two competing alliances on a flat, 27 x 54 foot field. Each Alliance consisted of three robots, and they competed to score as many discs into their goals as they could during a 2 minute and 15 second match. The higher the goal in which the disc was scored the more points the Alliance received. The match started with a 15-second autonomous period in which robots operated independently of driver inputs. Discs scored during this period were worth additional points. For the remainder of the match, drivers controlled robots and tired to maximize their alliance score by scoring as many goals as possible. The ended with robots attempting to climb up pyramids located near the middle of the field. Each robot earned points based on how high it climbed.